The properties of each Hohner instrument can be adjusted. Modartt has extended the range of Hohner keyboard emulations available for its Pianoteq software, adding the Electra Piano and Pianet T to the pre-existing Clavinet D6 and bundling all three instruments together. The Clavinet, of course, is a funk and soul staple, but the other two keyboards may require some introduction. The original Electra Piano featured forks that were struck by hammers, with the vibrations being electronically converted and transmitted to a transistorised amplifier. On the Pianet T, meanwhile, reeds are plucked by silicone rubber pads, with the resulting vibrations converted into an electrical signal via an electro-magnetic pickup. Modartt's emulations feature extended keyboard ranges, while the Pianet T and Clavinet D6 have sustain pedals. 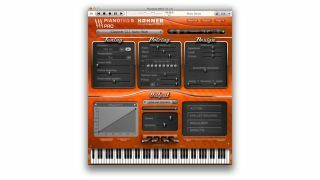 The Hohner Instrument Pack is sold as a €49 add-on for the latest version of Pianoteq (5.2). All owners of the existing Clavinet pack will get it for free, and you can take it for a spin as part of the demo version. Find out more on the Pianoteq website.